Swift in flight. Courtesy of Larouse Bird Guides. 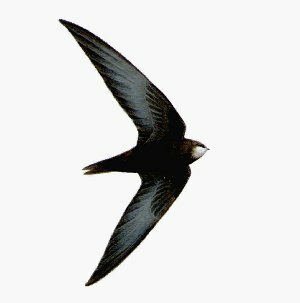 Serious concerns about the decline in swift numbers breeding in the UK in recent years have prompted Friends of Radley Lakes and the Abingdon Naturalists to launch a joint project to find out where in the Abingdon/ Radley area they nest and to encourage people to preserve and increase their nest sites. returning to the UK in May. • Put a few swift bricks into the walls you build if you are a developer. • Construct swift nest boxes from instructions we can send you. Contact David Guyoncourt on 01235 529151.
Who can fail to be thrilled by the sight and sound of swifts in high summer? This acrobatic bird truly deserves the title of king of the air as it has a greater mastery of the air than any other bird. It drinks, preens, collects food and nesting material and even mates on the wing. Evening flights of screaming swifts wheeling high over our towns and gardens or hurtling in groups just above our rooftops are an exciting summer feature in towns and cities all over the country. 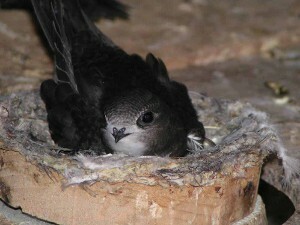 Swift on nest copyright Erich Kaiser. However, all is not well with our swifts. As they nest almost exclusively in holes under the eaves of buildings, home improvements like new roofs, plastic soffits and insulation and the demolition of old buildings are seriously affecting their numbers. According to the RSPB, swifts have declined nationally by almost half over the past decade. Swifts migrate here to breed from Southern Africa in May and leave in early August. This period coincides with long daylight hours and high insect populations. When they first arrive they congregate around large water bodies such as the Radley Lakes before dispersing to local towns and villages to nest. Swifts pair for life though pairs do not necessarily stay together outside the breeding season. Nests are reused and repaired year on year. 1. Safeguard existing nest sites. If you possibly can, leave existing nest sites undisturbed. If you are re-roofing make new nest holes to exactly match the old ones. If the nest site is occupied, you should realise that it is an offence under the Wildlife and Countryside Act to interfere with it in any way. 2. Use Swift Bricks. 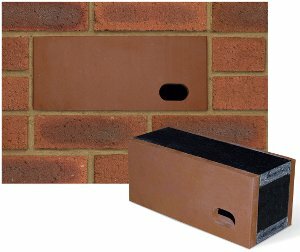 For new buildings you can build specially designed and inexpensive swift bricks into the walls to create new nest sites. Swift bricks can be purchased from Ibstock Bricks who make them in three clay colours and to fit in with UK brick sizes. Putting up nest boxes at St. Ethelwold's House, Abingdon. Copyright John Orme. 3. Put up a swift nest box. You can buy or make specially designed swift nest boxes . Details of where to purchase swift nest boxes can be found on the Swift Conservation website’s shopping page or you can download plans to make your own. A CD of swift calls can also be purchased from Swift Conservation and will encourage swifts to come and check out your new nest sites. For more information see www.swiftconservation.org. 4. Report your sightings. You are asked to report to us sightings of birds entering nest sites in the local area so that we can build up a picture of where they are and monitor them year on year. We will initially target conservation work on areas where swifts already nest. In the vicinity of nest sites swifts fly at low level ( below roof top height) in parties of up to a dozen birds uttering their characteristic screaming cries. These ‘screaming parties’ are a good indication of local breeding even if you do not observe them entering nest holes. 5. Swifts and similar looking summer migrants like swallows and house martins feed on flying insects. Unfortunately, the numbers of such insects has shown a marked decline in recent years so posing another problem for their survival. Using wildlife gardening methods to manage your garden will help reverse this decline and, at the same time, provide more food for swifts. So you can plant native trees, shrubs and wild flowers, make a compost heap, a log pile and a pond and garden organically without using chemicals that are harmful to wildlife. A muddy area by your pond will be particularly helpful to house martins and swallows who, unlike swifts, make their nests out of mud.